Bug: Storage tank slider levels don't persist in craft file. 1 - Attach a Radial Storage tank to the vessel in the VAB, on any resource type. The example pictured here uses Oxygen. 2 - Use the slider to reduce the storage to less than 100%. (See first image linked to below). 3 - Save vessel design. 4 - Launch Vessel. Notice the slider seems correct HERE - the reduced resource is rememebered (see second image linked to below). 5 - Recover Vessel. Go back to VAB. 6 - Click "new" vessel button. Click "Load" Vessel button. reload the same vessel design. 7 - The slider is back to 100% again. The .craft file seems to have no memory (or it does but it doesn't load properly) of the the slider's position, so it resets to default. The slider positions should probably persist in the craft file, just like the stock game does for reduced fuel levels. Where does the USI Fertiliser tank reside in the tech tree? I've unlocked all the other wedges and the correct USI ones are showing up so everything appears to be in order except...no fertiliser tank anywhere that I can see. With Kerbalism installed, the values for Oxygen and Hydrogen wedges are all messed up , and don't reflect the values in the spreadsheet you linked. All sizes of Hydrogen wedge are holding 21350 units, and the Oxygen values are 6100;1300;21350;21350. I've taken a look in the configs for those wedges, and it just looks like you forgot to put in proper values for the MM patch for Kerbalism. Should be an easy fix. The fuel cells seem to be massively underpowered compared to the (Kerbalism-ified) stock fuel cell, especially considering their mass. The Kerbalism-modded stock fuel cell produces about 4.7 EC per unit of Oxygen, whereas the two UvSii power cells produce only give 0.94 EC/ox. There is also no difference in terms of their efficiency, despite their descriptions. In order to bring them into line with stock, I suggest that you bump the EC output for the two power cells (when Kerbalism is installed, at least) to 12 EC (50% efficiency) and 33.6 EC (70% efficiency), respectively (assuming the stock cell has an efficiency in the region of 47%). Efficiency is the most important thing with fuel cells, not raw output. The other thing that seems odd is the very high mass of the cores as fuel tanks. Why does a dry LFO 8-core weigh 1.45 tonnes, when a structural core weighs only 0.225? Ref my question above, there doesn't actually appear to be a Fertiliser wedge in UvSII - the website suggests there is one but it's not in the code. I may have missed a post about it somewhere. In the meantime, USI fertiliser boxes actually fit quite neatly inside a UvSII faring. I had a poke in the configs and can see where UvSII Greywater tank is set to contain fertilizer if USI is installed. For some reason this isn't happening in my game - think something else is overriding it. I'm not an expert at reading logs but these may shed some light on where the problem lies. If anyone is able to help me interpret them I would be most grateful. Added 3rd part mod part variations to the website part catalog (required as Oxygen wedges have different capacity depending on which life support mod is installed). Replaced Cost and Mass values in part catalog with Wet cost and Wet mass where part includes resources by default. Some parts are missing Italian and German localization. Some configurable parts are not maintaining correct values when using sub assemblies. We've found a few issues like this, obviously not an easy fix, but it's being worked on. I'm getting a dry mass of 0.413t which seems reasonable. Processor balance is on the to-do list, however @Daishi is creating new models for some of the processors which will effect how they are balanced. I'm going to rebalance these parts once those new models are available. 1.3.1.9 is for KSP 1.3.1 only. The other version will work with KSP 1.4.5 up to the current version. Not sure if there's something wrong in the .version file for AVC. Shouldn't the version be 1.6.0.9? I have started uploading some Universal Storage II sample craft to Steam workshop. (find the link in my sig if you need it in the future). None of the more basic science experiments show up unless I filter by manufacture. Misery Goo and Materials Bay work fine but I cant click on the temperature/pressure sensor once placing its wedge. Update- I did some digging as noticed that dmagic isn't compatible yet. Is there any idea when the dmagic parts might get fixed? Has anyone come up with a unofficial MM patch to make them work? The latest version of Dmagic Orbital Science is compatible with Universal Storage II. I'm not sure why they aren't showing up though, @DMagic might be able to help you. Apparently I am out of luck according to DMgic's change log. I tried reinstalling both Orbital Science and Universal Storage II and deleting the MM cache. This broke the other stock science US 2 parts(Thermometer, goo, materials bay) I had and has removed them entirely from the VAB and Research Lab. If I load the ship with these saved parts it give me the warning they are no longer available but the models are still there so that's something. Has anyone noticed (on Version 1.5.1.8 and KSP 1.5.1) that the PEM Fuel Cell tends to shake craft apart when attached to the 4 core module? 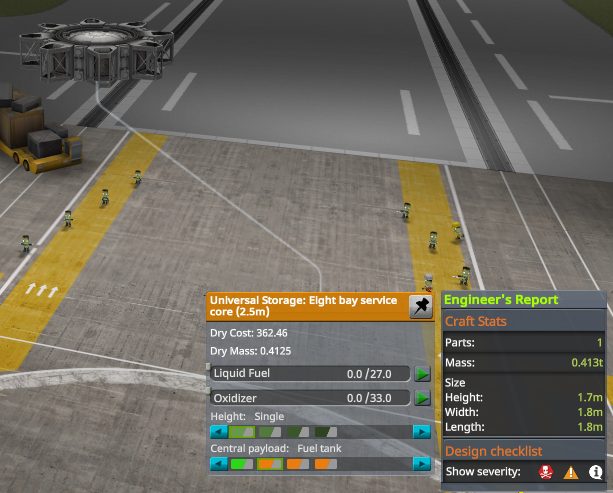 I had issues with craft shaking themselves to pieces after I deployed fairings. (They were fine while fairings were in place, but would start oscillating after the fairings were deployed) Initially I thought it was the 4 core module itself, until it happened on the pad. The craft stopped shaking after the connection between the PEM and the core failed and the PEM was thrown free. Edit: Fixed the issue, looks like it was the version of Kerbal Joint Reinforcement Continued (3.3.5) I was using, switched to Kerbal Joint Reinforcement 3.4.0.4, and it stops the shaking on the pad and in most instances in orbit. I say most instances, because occasionally there are some oscillations when craft are under automated control (i.e. Gravity Turn, if it uses warp). Edit: Maybe not, fixed on pad, the shock of decoupling can still cause craft to go out of control. Can you send me a craft file and list the mods you're using? Sure thing, Ill send a link now! It's not just the PEM. It's anything that uses the quad core higher than single (double, triple, quad). If you place struts from the fairing to above the core (granted it's a bit difficult) then it doesn't shake your craft apart. Just found out about this release (I'd only known of the original Universal Storage), and ohhh, those parts are so beautiful... and there's so much new stuff... this is immediately on my must-have mod list. I've just updated to 1.5.1. The way I understand it from this thread, I can safely remove US 1 in a new game. DMagic's mod update should have solved the last of the reasons to go fully US 2, right? Yep. There's a few parts still getting updated on US2's end, namely the stock experiments, but they're coming along nicely, if the previews @Daishi keeps posting in the dev thread are anything to go by. Yep, you should be set. Only issue is that the stock science parts have been omitted for now, while i create them for stock US2. Yeah they're coming along well! @Daishiand @MaverickSawyer, thanks. @Daishi I've said it before but it's worth saying again: Amazing work. Thanks for the effort and your dedication to improving KSP.